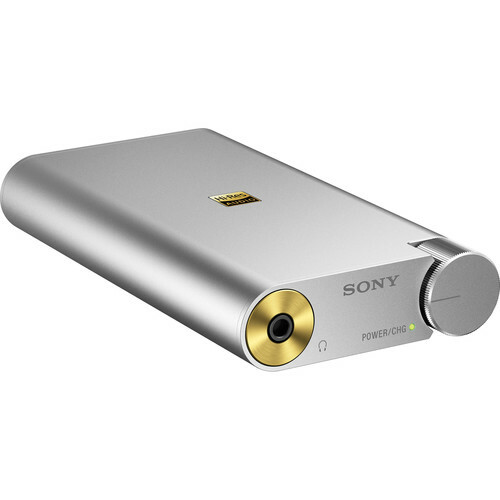 Designed for mobile Hi-Fi music enthusiasts, the Sony PHA-1A Portable High-Resolution DAC and Headphone Amplifier uses a Wolfson USB DAC with a separate amplifier section to deliver a broad frequency response of 10 to 100,000 Hz into headphones with an impedance range of 8 to 600 ohm. It supports playback of high resolution audio files up to 192 kHz/24-bit resolution with direct digital connection support for Walkman, Xperia, and iOS mobile devices. It uses high quality components to present a wall-balanced natural 3-dimensional sound stage. The combination DAC and amplifier is optimized for use with the MDR-1A and Walkman A10p mobile devices. The unit comes with two silicone bands for attaching your mobile device to the DAC/AMP as well as a protective sheet. Box Dimensions (LxWxH) 6.1 x 3.6 x 2.6"
PHA-1A Portable High-Resolution DAC and Headphone Amplifier is rated 4.5 out of 5 by 2. Rated 4 out of 5 by Eli from Great Portable High-Resolution DAC and Headphone Amplifier I use the PHA-1A to play FLAC file 44-192kHz from Nexus 5 mobile phone and Samsung Tab-S tablet, both android. I use the USB Audio Player Pro application on both. I connect the PHA-1A to both devices with the supplied cable (Sony says very little on compatibility, seems the cable is micro-usb to micro-usb OTG) and use Grado or Sennheiser headphones. Both need the Gin switch in the 'high' position. The soubd is great dynamic and rich, but I have no comparable device... Cons: 1. You can not charge the device while play (despite having a different connector for charging). 2. You need to purchase the AC charger separately. I've got a sony XZ which's got USB- C port. WIll this DAC work properly? Does this increase the sound volume or just clarity? Ill be using it with a pair of headphones with an impedance of 40 ohms 6-42,000 Hz. The Sony PHA-1A is a both headphone amplifier, giving you increased volume, as well as a DAC which will enhance the frequency response of your digital files.